Refer the Getting Started page of the introduction part to know more about the basic system requirements and the steps to configure Syncfusion File Format components in an ASP.NET Core application. Ensure once whether all the following dependency packages are included within the project.json file as mentioned here, to create and manipulate the Word documents using DocIO. Syncfusion.DocIO.AspNet.Core This package contains the core features needed for creating, reading, manipulating a Word document. Syncfusion.Compression.AspNet.Core This package is used to archive/extract the Word document contents. Syncfusion.OfficeChart.AspNet.Core This package contains the Office Chart Object model and core features needed for chart creation. An entire Word document is represented by an instance of WordDocument and it is root element of DocIO’s DOM. Word document contains a collection of sections. A Word document must contain at least one section. A section represents group of paragraphs, tables etc., that have a specific set of properties used to define the pages, number of columns, headers and footers and so on that decides how the text appears. A section should contain at least one paragraph in this body. The following code example explains how to add a section into a WordDocument instance. All the textual contents in a Word document is represented by Paragraphs. Within the paragraph, textual contents are grouped into one or more child elements such as text range, field etc. Each text range represents a region of text with a common set of rich text formatting. 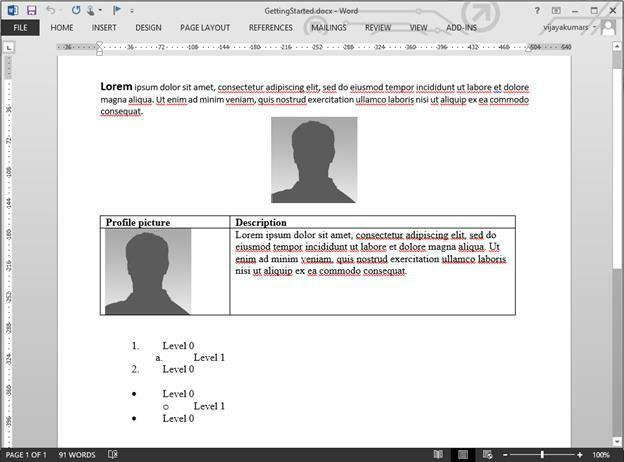 The following code example shows how to add an image into the Word document. Table is another important element in Word document that contains a set of paragraphs arranged in rows and columns. You can create simple as well as complex table by using Essential DocIO’s API. The following code example creates a simple table and adds contents into it. Each table cell must contain at least one paragraph. Essential DocIO allows you to create simple and multi-level lists. The following code snippet explains about how to create a numbered and bulleted list. Finally, save the document in file system and close its instance. The resultant Word document looks as follows. Essential DocIO allows to generate documents by filling data in template document from data source. Mail merge operation automatically maps the column name in the data source and names of the merge fields in the template Word document and fills the data. The following data sources are supported by Essential DocIO for performing Mail merge. Also, you can perform more than one Mail merge operations over the same template to generate document as per your requirement. Follow the given steps to perform simple Mail merge in a Word document. Let’s consider that you have a template Word document with merge fields as shown. The MailMerge class provides various overloads for Execute method to perform Mail merge from various data source. The Mail merge operation replaces the matching merge fields with the respective data. The following code example shows how to perform simple Mail merge by using string array. The resultant Word document look as follows. The region between these two merge fields get repeated for every record from the data source. For example – let’s consider that you have a template document as shown. 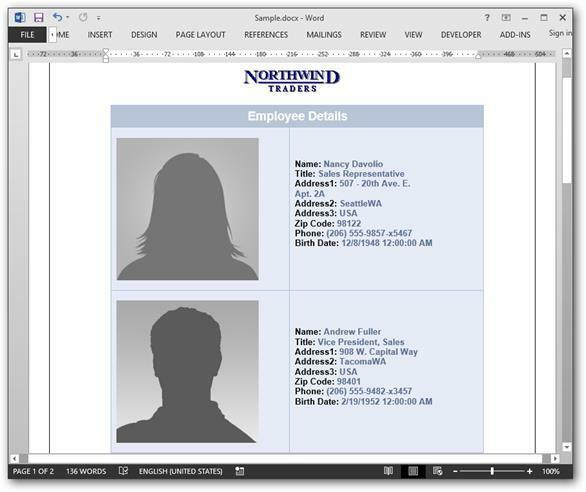 Here, in this template, Employees is the group name and exact same name should be used while performing Mail merge through code. There are two special merge fields “TableStart:Employees” and “TableEnd:Employees”, to denote the start and end of the Mail merge group. To merge an image in the replace of a merge field, you need to add a prefix (“Image:”)the merge field name. The following code example shows how to perform Mail merge with objects. The following code example provides supporting methods and class for the above code. The resultant document looks as follows.